Italianate and the Italian Villa homes are the most numerous of the early, stylish homes in Adrian—remaining popular well into the 1880s. Andrew Jackson Downing’s Treatise on the Theory and Practice of Landscape Gardening, Adapted to North America, 1841, pp 314-315. The Italian Villa style, which first appeared on houses in England in the early 19th century, was popularized in the United States by a series of popular books--starting in 1842 with Andrew Jackson Downing’s Treatise on the Theory and Practice of Landscape Gardening, Adapted to North America. This publication included a view and plan of the first significant Italian Villa in the United States: John Notman’s design for Bishop George Washington Doane’s 1837 Italian Villa in Burlington, New Jersey, which was known as Riverside Villa. In his book, when discussing "domestic" (residential) architecture, Downing condemned the use of the Greek and Gothic revival styles, and concluded about the Italianate style: "we can hardly imagine a mode of building, which in the hands of a man of wealth and taste, could in this country be made productive of more beauty, convenience, and luxury, than the modern Italian style..." (317). Downing’s pattern books set the standard for the Italian Villa style with its picturesque towers, hipped and low-pitched roofs, and tall, arch-shaped entrances and windows crowned by window heads--and especially deeply overhanging eaves supported by decorative brackets. It is this latter feature, the brackets under the eaves, that makes Italianate and Italian Villa homes easy to spot today. Today, most historians differentiate between two main styles of architecture inspired by Downing’s books: the Italian Villa and the Italianate. The Italian Villa has two main distinguishing features: a prominent tower, which was often called a campanile (an Italian church bell tower), and a picturesquely irregular plan. By way of contrast, the Italianate is distinguished by having rooms that conform to regular, geometric forms: usually a square or L-shaped plan. Moreover, in place of Italian Villa’s tower, the Italianate often features a cupola, which is a tower that rises from the roof and is sometimes referred to as a belvedere (French for a "good view"). 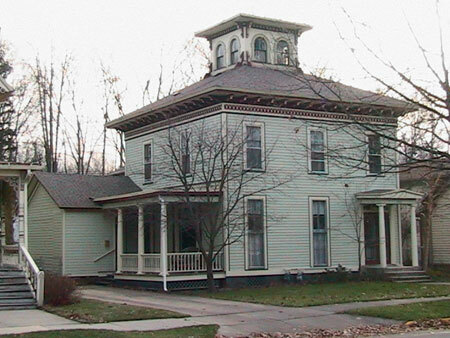 Besides adding a beautiful, picturesque quality to the home, cupolas and towers provided light and ventilation; to aid in ventilation, stairways were often placed beneath them. During hot summer months, warm air would rise up through the tower and draw cool evening air into the lower levels of the home. Italianate, Burnham Historical Building, 204 E. Church, Adrian, 1863. In the nineteenth century, the word “villa” had a somewhat different meaning than today. Downing felt a “villa” in the Italian style was suitable only for a family with “wealth sufficient to build and maintain it with some taste and elegance… and requiring the care of at least three servants” (quoted in Mary Mix Foley, The American House, 155). Its construction was often elaborate and thus required the services of a professional architect. Moreover, as the title of Downing’s Treatise on the Theory and Practice of Landscape Gardening suggests, the Italian Villa was supposed to be placed within a garden setting that required substantial land ownership—the origin of the American suburban ideal. The desire for a landscaped garden helps to explain why urban homes were placed so far apart in the middle of the nineteenth century—on property that today, for the most part, has been subdivided and filled in with homes of more recent styles. Yet, Downing’s pattern books also offered plans for small “cottages,” which he believed were better suited to common laborers. Descriptions of modest “farm-houses” were offered to families with middling resources. Indeed, pattern books from the nineteenth century presented designs for “Italian” homes with a broad range of forms, price levels, and picturesque names, including Tuscan Revival, Hudson River, Bracketed, Roman, Tuscan, Lombard, Vitruvian, Etruscan, Suburban, Greek, and Norman. Italianate features, especially brackets and round-arch windows, can also be found on urban townhouses as well as commercial buildings, as in downtown Adrian. Architects of these buildings recognized that neither an asymmetrical, suburban villa form nor landscaping properly belonged in a commercial center and looked instead to Italian cities for inspiration. They found their prototype in the Medici Palace, which was built in Florence in 1444 for a wealthy Renaissance banking family. Toward the end of the century, such symmetrical, Italianate commercial buildings were built with more “modern” features, such as mansard roofs and updated with windows featuring large panes of glass. Italianate, designed and built by local architect and builder O. P. Smith. In 1867, the height of the hose-drying tower was increased to seventy feet.